It was an up-and-down weekend for Pitt athletics, as some Panthers were at the hands of crushing defeat, while others found themselves above all the rest. Although baseball and women’s tennis struggled and gymnastics came up just short, softball and track and field both found success in North Carolina. The Panthers got swept in a three-game set against North Carolina in Chapel Hill. 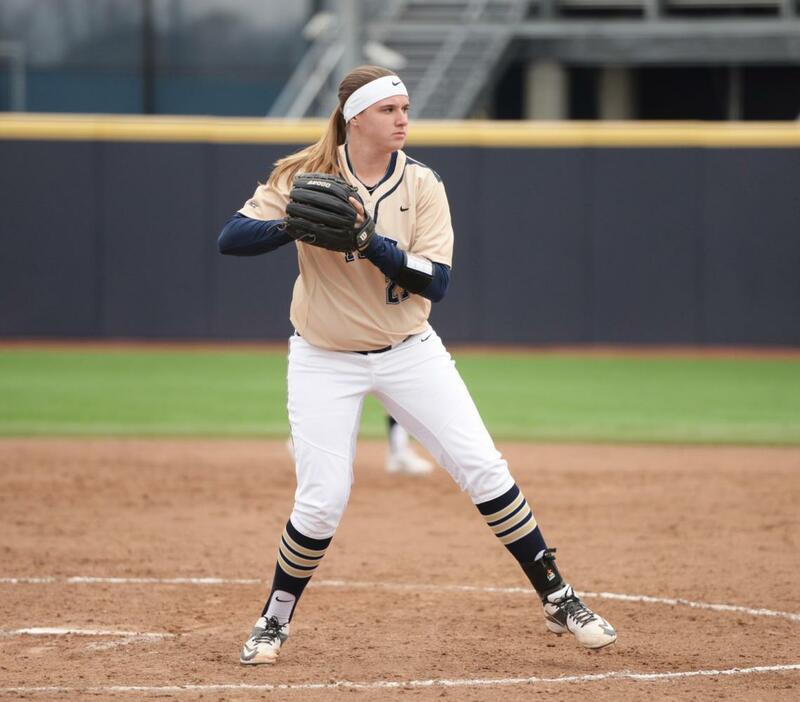 Pitt was blown out 15-3 in the first game, 4-0 in the second game and 13-2 in the third game. Despite the low offensive output as a team, first-year outfielder Ron Washington Jr. went 4-for-11 with a home run and two runs batted in. Redshirt junior third baseman Liam Sabino also contributed, going 3-for-10 with a double, a stolen base and two walks. The Panthers find themselves at 11-7 overall, but just 1-5 in the ACC. Pitt will travel to University Park to take on Penn State Wednesday, March 21, with first pitch at 6:30 p.m. The softball team came away winning two out of three against North Carolina, losing the first game 8-4 before winning the next two games 6-3 and 10-2. Senior catcher Giorgiana Zeremenko dominated the Tar Heels’ pitching staff, going 7-for-10 with three home runs and six runs batted in over the three-game series. Senior pitcher Kayla Harris picked up both of the Panthers’ wins, throwing a complete game on Saturday and three shutout innings of relief on Sunday. Pitt sits at 15-11-1 overall and 4-2 in the ACC. The Panthers will host Saint Francis University Wednesday, March 21, at 4 p.m. at Vartabedian Field. The Pitt gymnastics team suffered a narrow defeat against North Carolina by a score of 196.600-196.050. The Panthers placed in the top five 10 times with eight different athletes, including junior Kensleigh Owens and first-year Haley Brechwald, who tied for third place on the vault with a 9.850. Brechwald also finished third on the floor with a 9.875. Concluding the regular season with a 6-14 overall record and a 3-3 record in the ACC, the Panthers will compete in the EAGL Championship meet next Saturday, March 24, at 2 p.m. in Towson, Maryland. At the 49er Classic in Charlotte, North Carolina, 12 Panthers had top-10 finishes on the first day, as senior Quadaisha Newkirk finished second overall in the 400m, recording a 59.41. In the field events, first-year Greg Lauray finished third in the high jump at 2.05m, while fellow first-year Noah Walker finished third in javelin with a throw measuring 69.98m. A relay team of sophomore Genaya Johnson, senior Desiree Garland, sophomore Taylor Middleton and first-year Jaylyn Aminu finished first out of 32 teams in the women’s 4×100 with a 46.67 on the second day of competition. On the men’s side, the team of sophomore Dante Watson, first-year Ade Jones-Roundtree, junior Ken Brosier and first-year Lonzell Feagin won the men’s 4x400m relay at 3:10.50. The Panthers will compete at the CMU Invitational next weekend at Gesling Stadium here in Pittsburgh. The Panthers fell to No. 16 Wake Forest 5-2 on Saturday, as they now stand at 6-6 overall and remain winless in the ACC at 0-5. Juniors Luisa Varon and Natsumi Okamoto captured Pitt’s only wins against the Demon Deacons, as Varon defeated sophomore Chandler Carter 6-4, 6-3, and Okamoto took down sophomore Alexis Franco 6-4, 6-3. With their victories, Varon and Okamoto now possess records this spring of 5-5 and 8-3, respectively. On the doubles’ side, the Panthers couldn’t find success, failing to pick up any wins. Okamoto and junior Clara Lucas lost to Franco and first-year Eliza Omirou 6-1, while junior Gabriela Rezende and first-year Claudia Bartolome lost to Wake Forest’s redshirt sophomore Mary Caroline Meredith and junior Anna Ulyashchenko 6-1. The women’s tennis team heads to Blacksburg, Virginia, Friday to take on Virginia Tech at 3 p.m.